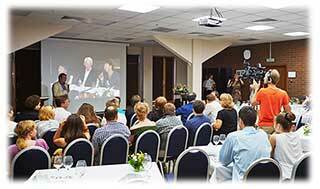 Broadcast your event in up to 6 concurrent languages to thousands of people all over the world via the internet. A new multi-lingual video streaming service which enables you to speak in your own language whilst your audience watches and listens in their own language from anywhere in the world over the internet – live and in real-time. The camera crew transmit your event over the internet to specially trained simultaneous interpreters who convert what is being said into your audience’s preferred language. The audio and video streams are then recombined and securely streamed to audience members over the internet. With a choice of over 170 languages and up to 6 concurrent language pairs, thousands of viewers can be supported meaning you can target multiple territories simultaneously giving your events phenomenal international impact and reach. Audience members watch on their computer screens or, with our High Definition option, at large screen events. Recordings are automatically created allowing later playback. 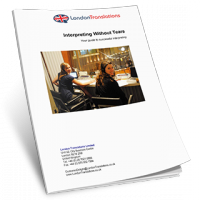 As with other forms of interpreting, providing your interpreters with plenty of background information in advance will dramatically increase the quality of the service they are able to provide you with.